The holidays are as usual a time of giving but can get expensive! A thoughtful gift for someone who you don’t know what to give or for pet lovers is homemade dog treats. I always find it more thoughtful to make a gift. I know we are all very busy this time of year so here is a simple recipe that is healthy for the pooches. Our pets take such good care of us it is only right for us to show them appreciation during the time of year when everyone is spending time with their loved ones. 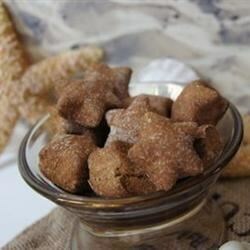 I found this recipe here at Allrecipies.com which had a variety of other simple dog treats to choose from. 2. Lightly grease 2 large baking sheets. 3. Combine water, mashed bananas, honey, vanilla, and egg in a large bowl. 4. Stir in the flour and baking powder. 5. Beat dough with an electric mixer on medium speed until ingredients are thoroughly combined for about 1 to 2 minutes. 6. Turn dough onto a floured surface and knead until no longer sticky, 5 to 8 minutes. 7. Roll out dough to 1/4-inch thickness and cut into mini shapes with your favorite cookie cutter. 8. Place dough shapes on prepared baking sheets. 9. Bake in preheated oven until cookies are lightly browned, about 20 minutes. 10. Turn off the oven and leave cookies until thoroughly dry and crisp, 30 to 40 more minutes. 11. Remove baking sheets from oven and allow cookies to cool on pans for 10 minutes. Transfer cookies to wire rack to fully cool.